I aint got no chamber lentgh tools so I'll put a bullet in an primed neck sized case and close the action on it slowly then extract slowly and check fer touch and deduce OTL lentgh from there, then, check a few loaded rounds to be sure, esp after the bore heats up. Nice illustration. I have read the "just off the lands" theory ad nauseum in books and online. What I can't figure out is why there are exceptions to the rule. All benchrest shooters I know load as you do. How in heck do Weatherby's have such good accuracy with standard (magazine-length) cartridges??? I tested a series of 5 rounds each in .015" steps loaded single-shot into my .300 WBY mag that ran from .020" off the lands all the way back to mag-length and all shot beautifully tight groups. There was no discernable difference between the group sizes. I ran the same test a second time just to be sure and had the same results. I also checked the jump in my .204 Ruger, and it is HUGE. Depending on bullet profile, it can be almost as much as the WBY. The rifle still puts all the rounds in one tiny hole. If I really take my time and do my part, it is often very hard to tell difference in the hole in the paper between a single round and a 5-shot group. I am not complaining, but do you have any idea why ??? Yes I do Marty... but like all knowlwdge I borrowed it from someone else. Eric Stecker of Berger Bullets penned this little treatise on bullet jump and the VLD (very low drag) bullets. A lot also comes from how true the freebore is and how concentric you loaded the rounds. Dawgdad, thanks for all the good information. It was a good read. I was more interested in your COAL to see if there were any magazines I could find that might provide a load length long enough. My Magpul thermal-plastic mags are great but 2.240" is pretty much the limit. I've heard that the PRI mags might let you load to 2.3+ a little. I will tell you that my loads are over 2.4++" with these bullets. No magazine will hold them and they were not designed to be loaded down to mag length. 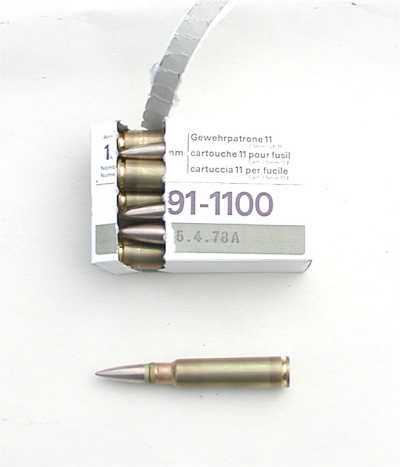 The shape of the point of the bullet is such that the ogive would be below the case mouth and it would be impossible to get a grip on the bullet if the tip was set to mag length. Plus even if you did manage to get the bullet to seat you would have taken up so much case space in the .223 case you would not get enough powder to get enough velocity to make a good 600 yard load. Thanks, Dawgdad, a very good read. The wheels are turning. I could design a magazine that allowed this to load. It would be unique but could be done. Usually, when I think of something new, someone has already done it. A google search didn't come up with anything but that doesn't mean that it hasn't been done already. One more point to consider.. I had some shots going off call at 600 last weekend so I just measured my chamber again tonight. After 1396 rounds the chamber had receded .025". Now I have to re set the bullet seater to account for the extra distance to keep the jump at .015". I should have checked it sooner and been growing to 'chase the lands' instead of waiting for the loss of points in a match. BTW - it is still a hammer at 200 and 300 yards with mag length bullets. I did not want to go there all at once since some of this is hard to get your head around unles you are loking at a cut away chamber and barrel and trying differnt things. The Secant VLD bullets like the Berger, Hornady A-max and 80 SMK's will have very long COAL's compared to the Tangent design bullets but the actual Ogive jump is not as different. My long range bullets are A-max 75's have a COAL of 2.435" and a ogive length of 1.905"
with the Ogive length of 1.840"
To get back to Marty's issue the tangent designed bullets are much less picky about the jump since they have a longer bearing surface and will "straighten them selves out " in the throat and barrel while the secant profile bullets can get squirrely and will be pitching and yawing if they are not very concentric with the bore. (runnout under .003") When they come out right they have a huge advantage at longer range. But they take a little work to get er done. If you do not want to take the time to craft a long range (500+ yards) the "short line" loads do work out to 600 but the wind drift error for missing a wind call by a couple of mph is the difference between a hit and a miss. Dawgdad, thanks for all this good "understanding" Hopefully, this RRA Varmint upper will give me some good experience and be a good shooter. I think I'll pick-up a pack of Hornady 75gr A-Max tomorrow when I drive by Cabela's. After a good barrel break-in, I'll start to work some single shoot loads. For now, I've got the 69gr SMK Fiocchi Match for the 300 yard work and to play with the wind at 500 yards. The 77gr SMK does have a better BC but the 69gr also work in my 1:9 twist - the 77gr not so well. Suz IIRC K31's have like zero freebore so any bullet you use will be into the lands. I would look at the Speer 125 TNT HP for a reduce weight lighter kicking bullet than the 174 pill in the GP11. This is also why sometimes people think their seater die is messed up because it cannot hold an OAL under .010". Quality seater stems do not seat on the tip but have an opening that is close to the ogive. Great point. Pulled my LEE seater apart for my 300 and yep- stem has a nice deep hole. Seats bullets using the ogive, just above it actually.